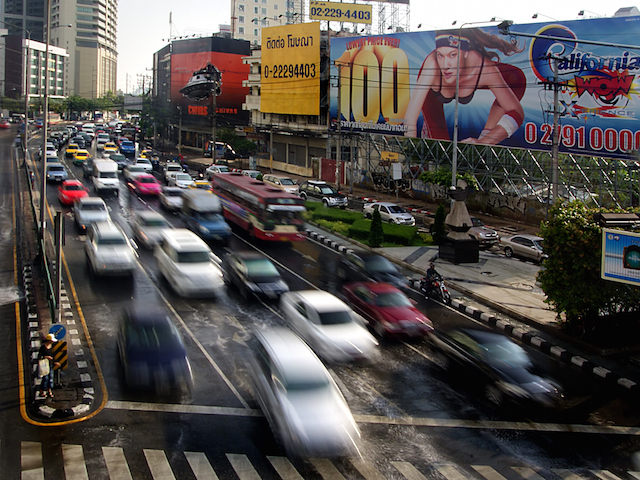 This week is UN Global Road Safety Week, focused on the theme “Slow Down, Save Lives.” WRI works to make cities around the world safer and more sustainable by implementing street design and regulations that reduce vehicle speeds while supporting walking and cycling. There is a growing body of evidence on the impacts and wider benefits of such efforts, which we’ll explore in blog posts this week. Traffic crashes kill 1.25 million people every year and cause permanent disability to millions more. No matter the location, speed is frequently a factor. Deaths and serious injuries are the painful and highly visible result of a lack of road safety, but we have lost more to high car speeds than we realize. What about fear of children playing on sidewalks, walking to school, or learning to ride a bike? What about people who struggle to pay high transport costs, but don’t feel safe commuting by bike? Speeding cars can limit physical activity, use of public space and quality of life, and the impacts are felt most by the least advantaged. Lower-income residents often live in close proximity to roads with dangerously fast-moving traffic. They are also more dependent on walking, biking or public transport, which are most exposed to the danger of speeding cars. These negative impacts are even more dramatic in developing countries, where a rapid increase in car and motorcycle ownership is taking place on roads with little speed regulation. 1. Lower speeds save lives. Every 1.6 kilometer-per-hour (1 mph) reduction in vehicle speeds on urban streets results in a 6 percent decrease in traffic fatalities. Lower speed limits reduce traffic fatalities and serious injuries for a combination of reasons. For one, driving at very high speeds can result in tunnel vision and decreased depth perception for the driver . At lower speeds, drivers have a wider field of vision and are more likely to notice other road-users. At lower speeds, even if a crash does occur, the consequences will be less severe, especially if it involves a pedestrian, cyclist or motorcyclist. A pedestrian has a 90 percent chance of survival if hit by a vehicle moving at 30 kmph (18.64 mph). This decreases to 70 percent at 40 kmph (24.85 mph) and less than 20 percent at 50kmph (31 mph). Driving at lower speeds also enables drivers to stop within a shorter distance. The stopping distance of a vehicle is a combination of the distance travelled during the driver’s reaction time and the distance it takes for the car to stop after the brakes are applied. At higher speeds, a car travels further during this reaction time and the stopping distance is greater. This affects the rate of momentum at the point of a crash, and therefore the possibility of survival. 2. 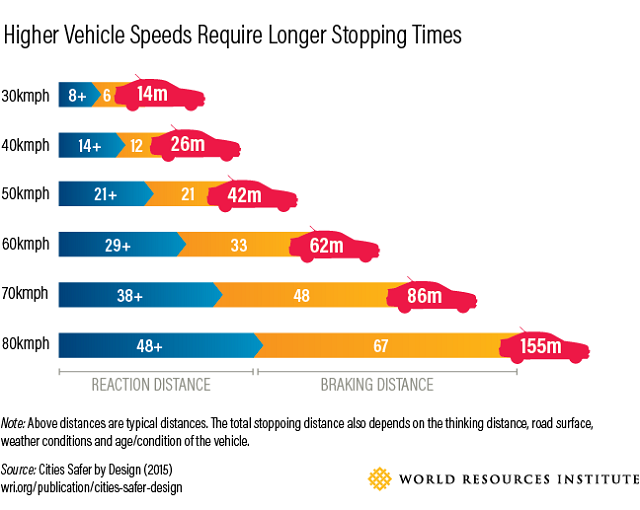 Safer speed limits don’t necessarily make trips longer. 3. 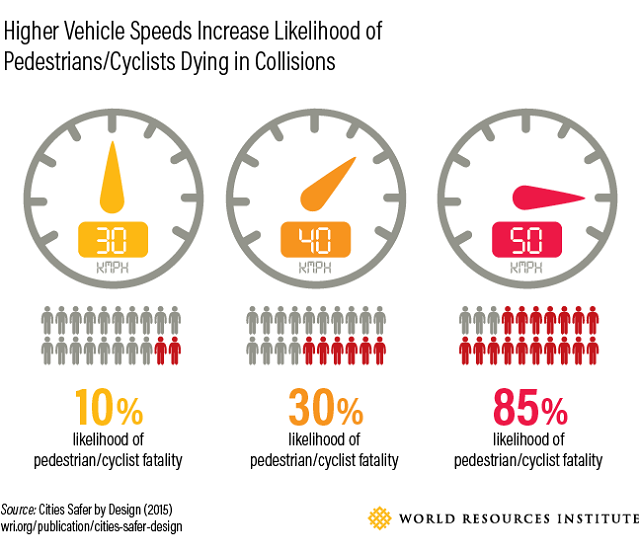 Designing for safer speeds fosters healthier communities. Lower car speeds create a more comfortable environment for pedestrians and cyclists. Street design that encourages safer speeds—such as narrower lanes and wider sidewalks, raised crosswalks and curb extensions—also provide more space for pedestrians and make it easier to cross the road. 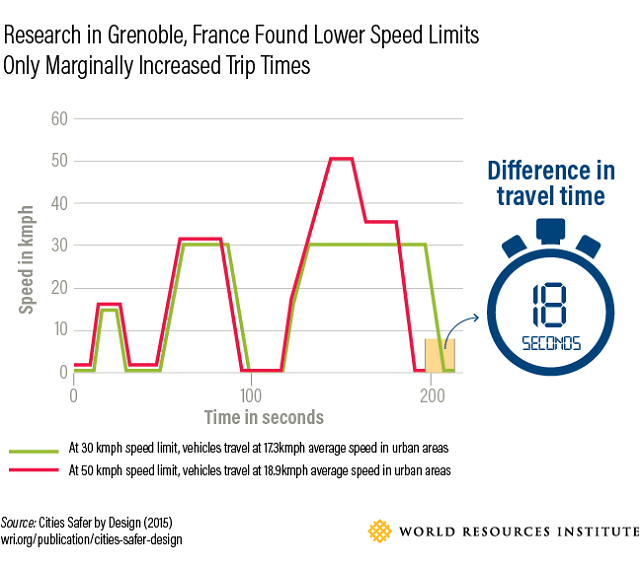 Details on these and other measures can be found in WRI’s Cities Safer by Design report. With speed-slowing infrastructure, cities may see positive trends in residents opting to walk or bike instead of driving. London is currently employing these measures to encourage more walking trips, and anticipates it will reap health and economic benefits. One study found that the United States could save $5.6 billion in health care costs if one in 10 adults started walking regularly. Residents opting to take fewer trips by car also means fewer harmful emissions and a reduced overall risk of traffic collisions. 4. Slower speeds are good for the economy. Studies have found that streets that are more inviting for walkers and cyclists are more vibrant and economically successful than streets with high volumes of fast-moving traffic. Benefits include increased real estate value and higher spending on retail and services, boosting the local economy. For example, when street designs with narrower lanes slowed traffic in the Mission District of San Francisco, nearly 60 percent of retailers reported increased spending by local people, and nearly 40 percent reported an overall increase in sales. Meanwhile, London’s Kensington Street saw a 13 percent increase in the price of apartments when safety and design improvements were made to the streetscape, and estimates that better shopping access for pedestrians will generate millions of pounds in increased retail spending. The research is now abundantly clear: Getting drivers to slow down can improve the quality of life for all city dwellers.